There are many discrepancies in our nativity. There are Origami Christmas trees, non-native to Bethlehem, stars standing on the ground. Baby Jesus has already arrived, and it isn’t Christmas day yet. Every time I walk by, I can’t decide if we need to add some cream colored, glitter-flecked tulle to the whole scene as a backdrop. 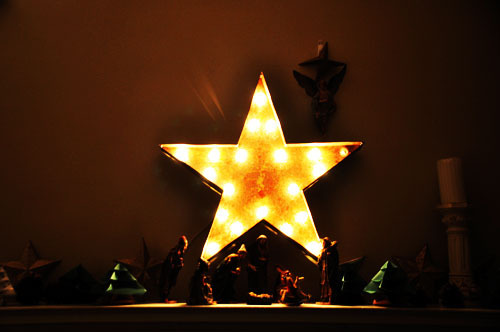 I notice that the Three Wise Men look intensely curious, and weary, from following that star in the east for so long. They seem more excited to be here than anyone else. Yet, that raises the next descrepancy. The Wise Men really never made it to the manger. They visited Jesus at the house; and not when Jesus was a baby. 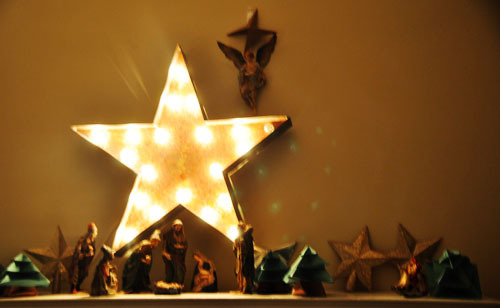 By the time the star led the Wise Men to Jesus, he was between 40 days and 2 years old. The boys have lined the key players up on the mantle. Mary, Joseph, the Shepherds and the Angel, and we’re going forward with it – just as it is. Faux pas and all. 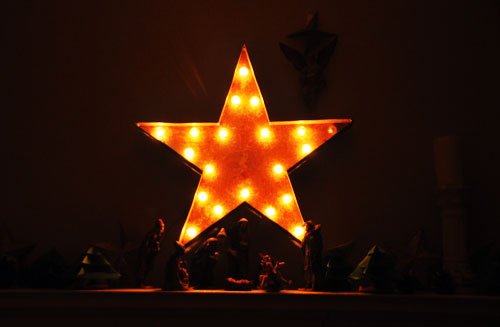 The star, given to us by Vintage Marquee, warms the whole scene. We can’t part with the glow from that star. How could we keep baby Jesus out of all that glow and glitz? Without a Hubble telescope, and thousands of years of collected data, analyzed by satellite images, how did the Wise Men make it to Bethlehem, following that star in the East? Tonight we read the obscure story, The Angel and the Donkey , a story that takes place thousands of years before Jesus’ birth. This was tonight’s Jesse Advent reading. Balaam was late for a very important, urgent meeting with the king. This king’s job would endow Balaam with a handsome payment in shimmery gold – if he could just get this donkey to move. 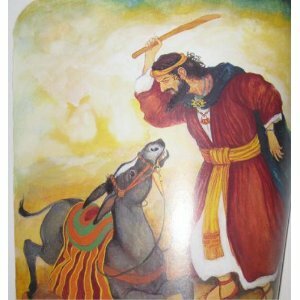 But Balaam is lying on the road, and won’t get up. In frustration, Balaam beats his donkey – and that’s when the angel steps in to intervene. The wise donkey could see the angel all along. Nevertheless, Balaam, because his pride, couldn’t see this angel who had an urgent message: Balaam is not to bid the king’s wish, to destroy the Israelites. This is clearly a story about right and wrong, about animal cruelty and how God won’t stand for any such thing, and how we shouldn’t either — and especially when it’s directed at other humans. Balaam and Balaak where guilty of all of those things, if only in their hearts. God wins. Is it any wonder these Wise Mien look so astounded? They came with one purpose: To worship him. Savoring this moment for all of the ancestral colleagues that studied and measured and put all the pieces together for this very moment. Is Gratitude the Great Betrayer?